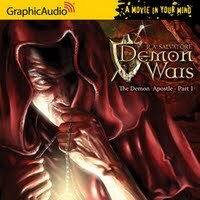 "The Demon Apostle - Part 1"
Book 3 of the "Demon Wars Saga"
Continuing on with book three of the seven book series of R.A. Salvatore's "Demon Wars Saga," GraphicAudio,and their magical production skills, transport you back into the world of Corona. With superb sound effects, awesome acting and mind-blowing music you will experience what GraphicAudio calls "A Movie in Your Mind." So far, they have broken up each book into three parts keeping them at five or six hours per section. This formula seems to work well, but I can say I get anxious to jump into the next part as soon as I hear the last word of each segment. Elbryan Wyndon, the Nightbird, travels north to take back the Timberlands with the help of Bradwarden the Centaur and Belli'mar Juraviel the elf, while Pony moves south to the city of Palmaris for a few of reasons one to find what has happened to Roger Lockless and the other to find out the state of affairs in the crucial city of Palmaris and also to seek revenge on the church that killed her adopted family. A civil war between Church and State in Honce-the-Bear seems imminent. The Abellican Church, and her Father Abbot's desire to take back the magic gemstones dog the steps of the heroes, especially those of Jilseponie, who has possession of hte magic gemstones and has just recently learned of her pregnancy. In the church itself, the Father Abbot Markwart seems to actually be showing signs of his demon posession. He has shaved his head and his ears are starting to become pointy. To many who view this, including his right hand man Brother Francis, the change is startling. Markwart has also discovered some new uses of the magical stones and soon begins using them with far more ease than any monk before, but his uses are starting to lean into the dark forces. Brother Francis is conflicted about where the church and Markwart are heading and even begins questioning his own faith. The biggest guilt on his concious is that Master Jojonah forgave him as he was executed. This weighs heavy on Francis' soul. In the North Elbryan and company are still fighting goblins, dwarves and giants and in the South the church is creating discontent among the secular rulers, and the excitement never stops in this installment of "The Demon Wars Saga."